VetshopAustralia.com.au, the world-renowned on-line retailer of pet supplies, announced this week they would bring back the popular Surfing Dogs Spectacular for the third year running at the 2014 Cricks Noosa Festival of Surfing. 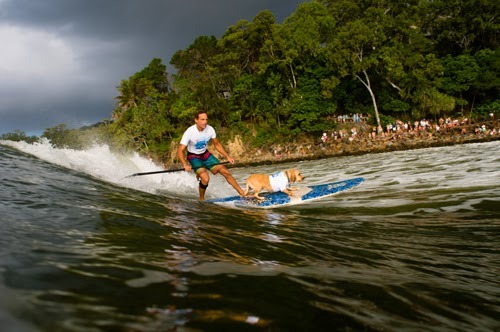 An instant hit when it was introduced at the 2012 Noosa Festival, the Surfing Dogs Spectacular has become one of the festival’s most popular events, attracting thousands of non-surfers to Noosa’s Main Beach and being seen around the world on social media. Festival director Phil Jarratt said he was thrilled that VetshopAustralia.com.au had come back on board with a bigger two-day program of events for dog lovers and surfers who love dogs. VetshopAustralia.com.au’s Director and head Veterinarian, Dr Mark Perissinotto, said the award-winning on-line retailer had found a great fit with the Noosa Festival, with coverage of the Surfing Dogs taking their brand around the world. VetshopAustralia.com.au’s Surfing Dog Spectacular will begin with two free public workshops on Saturday, 8 March, both hosted by world champion waterman and dog trainer Chris De Aboitiz. On Saturday morning at 9am at Noosa Spit, Chris will hold a beginners workshop, inviting the general public to bring their four legged companions along for a crash course in surfing, plus general tips on dog water safety and obedience. On Saturday afternoon at the PJ Burns Festival Village, Chris will hold a Master Class for intermediate surfing dogs and owners. In the lead-up to the Festival’s traditional Hawaiian opening ceremony at sunset on Sunday 9th March, the VetshopAustralia.com.au Surfing Dog Spectacular will feature Chris and the best of Australia’s surfing dogs in an exhibition contest that is guaranteed to delight the capacity crowd. In keeping with beach regulations, all participating dogs will be kept strictly in the control of their owners throughout the event and will be on leads when on the sand. VetshopAustralia.com.au will also be offering online customers and festival-goers the chance to win a fantastic family prize package including a Quintrex 420 Busta runabout and stand up paddle board, valued at $10,000. Buy in-store for a chance to win $10,000 cash!